Original title: Les possibilités d’une île: insularités oasiennes au Sahara. A possible definition of the term “island” is “a piece of land surrounded by water on all sides”. It looks as though here the oasis objects are precisely the opposite: water surrounded by arid lands. The presence of water is essential to an oasis, it is however not sufficient, are also needed mankind organized in society, armed with the know-how to ensure the organization, distribution and use (especially for agriculture). So why talking about island? An etymological meaning is the Latin insula, which refers to a situation of isolation. Relevance to think oases like islands is due to the fact that they are the place of human settlements, forming a network in the desert, as the islands on the maritime territory. 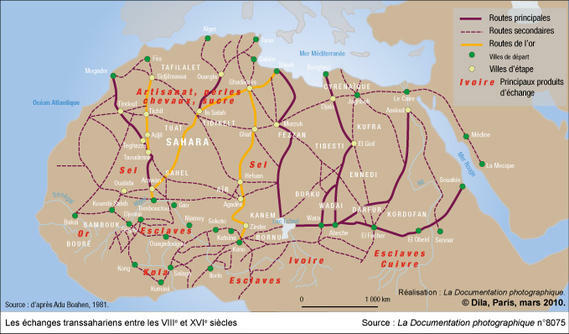 We can compare the maps of Saharan transportation networks with sea routes maps: always with the least possible detours, they are paths that connect one point to another. Between, are empty (or almost) horizons, only intended, for men, to be crossed. The early colonial imagery has used this maritime motif for the desert: ports, sand sea, and desert vessels. However, the Arabic literature as well abused of this maritime metaphor. What does imply this island condition? A possibility: to be a network node. Part of the oases flourished contributing caravan relations between the North-South and East-West shores of the Sahara. They are located on the trans-Saharan routes widely used in the Middle Ages, but in place since Antiquity, including the trade for gold, salt, slaves, dates, and other commodities, or by pilgrims and travelers alike, between the shores of the Sahara, between Maghreb and Sub-Saharan empires, between Morocco and Egypt. As stopovers, oases ensured the supply caravans, and these caravans ensured the supply of the oases, in goods (the arrival of the caravan was often a chance for a market), news, ideas (many oases housed schools), as well as languages (with linguistic contacts between Berber, Arab and sub-Saharan languages). The oasis exported part of its production (dates, cereals, etc..): an essential articulation of its economy. The trans-Saharan trade has dwindled between the sixteenth and seventeenth centuries (because of the maritime competition), but the caravans have not disappeared before the advent of the truck with the twentieth century. This is because the colonial armies discovered the oases at a time the trans-Saharan trade has decreased significantly, that we underestimated how much oases were rooted in networks, that we overestimated their autarky. The possibility of an island is to be a node of that networks that embrace the “desolated” immensity. “Desolated” because it is in this way that most of the oasis dwellers perceive these desert spaces, contrary to the idea we usually attribute to them, as desert-lovers. The interdependence between these nodes and the network is functional, it is also of essential nature: the existence of the oases is due to their articulation as well with farming, with areas of irrigated agriculture (often palm groves). The oasis agro-ecosystem must be understood as an anthropic bubble, for sure ingenious, but certainly artificial, all its components, all its plant material, has been formerly imported. By this very same network. The potential island function remains (set in its geography?) for the oases, although Saharan tracks partly fade: specific situations can just reactivate it. The instability of central governments has recently favored, during this twenty-first century, a resumption of the ancient routes between the caravan ports: smuggling of goods and human trafficking between Morocco and Egypt, between Sudan and Libya, or Senegal and Morocco. This was particularly visible in Siwa (Egypt, near the Libyan border) with the Egyptian and Libyan political crises in recent months. Le Sahara au cœur des échanges africains du VIIIe au XVIe s.
This article has been read 1709 times. Dernière mise à jour de cette page le Tuesday 5 January 2016 à 16:54:15. //// -----> Citer cette page? Vincent Battesti, "The possibilities of an island: Oasian insularities in the Sahara" [en ligne], in vbat.org anthropoasis, page publiée le 8 November 2013 [visitée le 13 April 2019], disponible sur: http://vbat.org/spip.php?article661.